Here's kind of a cool idea for iPhone users. Rumor has it that Steve Jobs hated the idea of LED's on phones. I guess it ruined the aesthetic or something. However, one of the things I miss about other phones I've owned is that the iPhone does not have a blinking notification when I get a message or miss a call. My LED changes all that. It plugs into your headphone jack and blinks when you receive a message, miss a call, or get an email. It's a pretty slick and easy solution if you ask me. It's appearing now on Kickstarter so if you are interested or want more details, head on over. Seriously, I want to thank all of you who took time out of your busy schedules to spend the time with me. I certainly and sincerely hope the time spent was well worth it for you. My first seminar series for Catapult University is now complete. I'll be doing others in the future, so if you would lie to suggest topics, I'm certainly open to that. Feel free to let me know your recommendations in the comments section. We've all had those moments where you try to send a rather large attachment and then you get the dreaded error message that tells you it's just too big to go through? Usually this shows up after your computer has cranked a while *trying* to send it so you've also got the dreaded downtime that comes with it as well. If you are a Gmail user, those days could be over. On November 27th, Google announced it is providing integration between Gmail and the Google Drive service. What that means is that now a Gmail message will be able to send an attachment that is up to 10GB. That's right, 10GB. I honestly cannot remember a time that I ever needed to send a file that large… and I've sent some pretty big files in my day. If you are a Gmail user, you should know that the new integration will only with Google's new Compose Format, but that isn't a big deal. I can remember when Gmail was invitation only and I was thrilled to finally get my invite. I knew, even back then, that there would be some cool things to come along with it. As I've said here before, it's becoming a Cloud based world and tons of our data is going to be there sooner as opposed to later. Now we've got one more reason to embrace the Cloud for all of this stuff since Google Drive is a Cloud base storage service (which I happen to use and like, but i also use and like Amazon's service as well). So Gmail users, I thought you'd like to know this. Enjoy! Membership in the Dentrix Developer Program allows DEXIS to provide products that are Dentrix G5 Connected. These products, available in the brand new Dentrix MarketPlace, can assist Dentrix users in meeting their practice needs. X-ray system that fully integrates with Dentrix, proudly announces that it is now a member of the Dentrix Developer Program. The Program was created for those companies that want to develop specific Dentrix G5 Connected applications. Both the DEXIS® Digital Imaging System and the DEXIS® Integrator™ for DENTRIX® have also been accepted into the Dentrix MarketPlace program. The Dentrix MarketPlace online portal provides a central location for users to easily review and select technologies that are associated with their Dentrix program and which ultimately enhance their practices. The DEXIS Digital Imaging System with its award-winning Platinum Sensor and the feature-rich DEXIS® Imaging Suite software provides clinicians with the best image quality, most comfortable sensor, and fastest workflow. * DEXIS Integrator for DENTRIX affords a seamless way for DEXIS and Dentrix to work efficiently together. DEXIS is an industry leader in developing high quality digital imaging solutions for the dental community. In 1997, DEXIS introduced digital radiography on laptop computers — making it the first truly portable and affordable digital X-ray system. In 2001, DEXIS became the first intra-oral digital radiography system to be accepted by the American Dental Association into the highly prestigious ADA Seal Program. Today, DEXIS is the most highly awarded intra-oral digital X-ray system with numerous awards from dental researchers and well-respected dental publications. For more information on DEXIS Imaging Suite and the DEXIS Platinum Sensor, and to learn about DEXIS imaging solutions, visit www.dexis.com. In August, I was invited to a think tank meeting put on by Henry Schein. At the meeting, the company showed us quite a few cool ideas they were working on for the future. Of course I had to sign documents declaring that I wouldn't reveal the secrets I would learn. I was happy to do that as it allowed me to see things that I could then comment about in the future. Well, the future is now and I'm excited that the official launch of the Schein Mac practice management system is here!. I was impressed with what I saw back in August and I know that they've been hard at work on it since then, so I'm sure it's only gotten better. If you are a Mac user that has been looking for dental software, this should definitely be on your radar. MELVILLE, N.Y., November 25, 2012 -- Henry Schein, Inc. (NASDAQ: HSIC), the world’s largest provider of health care products and services to office-based dental, medical and animal health practitioners, today announced the launch of “Viive,” a new dental practice management software for the Apple Mac computer. Viive (pronounced “Vive”) features a patient-centric workflow on a simple and clean platform to manage dental practices. The new workflow takes advantage of the Mac operating system to provide access to all available management tools directly from one patient screen, streamlining task management to a single click. Charts, ledgers, and other tasks are completed faster and more simply by eliminating the need to switch between modules. “Viive has a very aesthetic, clean, beautiful look. Its patient-centric approach makes it easy to gain access to information, charts and management tools,” said Dr. Derek Fine, a Viive user practicing in Denville, NJ. Another reason for Viive’s speed is its powerful PostgreSQL database, which loads charts and dental images almost instantly, synchronizes records in real time and allows updates to the same patient record from the front and back office simultaneously. “With more dentists choosing the Mac platform, Viive will become an important foundation for the integrated digital Mac office,” Mr. Bunker added. Viive was built directly on the Mac OS X platform, providing the user with the same robust, simple features already built into the Mac operating system. “I love Mac computers because of their elegance, combined with simplicity and ease of use. Henry Schein successfully captured that balance in the Viive practice management system,” said Liz Alexander, an office manager based in Doylestown, PA. The Viive Practice Management system will be launched with a number of equipment partnerships that ensure a comprehensive imaging solution and integration of core technologies. These include: Planmeca, digital x-ray and imaging; Digital Doc intraoral cameras; and Acteon dental imaging equipment. Henry Schein, Inc. is the world’s largest provider of health care products and services to office-based dental, medical and animal health practitioners. The Company also serves dental laboratories, government and institutional health care clinics, and other alternate care sites. A Fortune 500® Company and a member of the NASDAQ 100® Index, Henry Schein employs more than 15,000 Team Schein Members and serves approximately 775,000 customers. The Company offers a comprehensive selection of products and services, including value-added solutions for operating efficient practices and delivering high-quality care. Henry Schein operates through a centralized and automated distribution network, with a selection of more than 90,000 national and Henry Schein private-brand products in stock, as well as more than 100,000 additional products available as special-order items. The Company also offers its customers exclusive, innovative technology solutions, including practice management software and e-commerce solutions, as well as a broad range of financial services. 18 percent since Henry Schein became a public company in 1995. For more information, visit the Henry Schein Web site at www.henryschein.com. It seems that all is fair in love & cyber stuff. Or so it would seem between the US and France. It seems that the French government is accusing the US of a Spear Phishing attack from last May that could have compromised some French government sites. It seems that whoever perpetrated the attack went to Facebook to find Friends of targeted users. The users were then sent emails that contained a link that looked identical to a government site that asked for their username and password. Once entered, the fake site saved the info & it was then available to whoever perpetrated the hoax. Read all the details at C-net.com. As a diehard geek, I got my start with technology by tearing apart computers and putting them back together. Back in the early days, I had adequate free time and every time I took something apart, I learned something about it. I also learned through the time I spent breaking stuff and trying to make things do things they shouldn't be doing, that I loved trouble shooting. In the early days of dental tech, I would be in my office late into the night taking things apart and seeing how they worked. The counter tops in the back room were frequently covered with wires and all kinds of chips and spare parts. As the tech boom continued and things got easier to work with… and more reliable, the need to take things apart down to the bolts became un-necessary. However, I also missed those days of exploration. Now, I have the bug back! This fall I purchased a drone. That's right an unmanned aerial vehicle is now in my home. I had been reading about these things for a while and finally an article in Wired got my interest up to the point that I decided to jump in. You can buy a drone fully assembled or just order the parts and build it yourself. The DIY Drones website and community are an open source group that have dedicated themselves to flying both helicopter and plane type drone systems. My system is now fully functioning and is in the process of making small "baby step" test flights. These things have circuit boards that allow for GPS, auto stabilization, auto piloting, you name it. I'll be purring up more info as I gain experience, but if you've ever wanted to fly, this is your chance! I'm having a blast! We've all had it happen to us. Despite our best efforts, eventually there will be a computer crash somewhere and it will mean lost data, income, memories, and lots of other stuff. Because of that, it is *really* important that you backup your data. It's really not that difficult and the amount of time and expense you save is well worth it. There are lots of websites out there that will teach you the proper protocol. They are just a Google search away. Unfortunately, most folks don't' back up adequately and frequently it's because they feel that "it can't happen to me". However, trust me, it can happen to you. It has happened to me and even though I'm more prepared that most, I've still had problems. Now here is a story from the Associated Press about a computer crash that has affected the Buchanan County Sheriff's Department in MIssouri. Please read the AP story below and realize that if it can happen to them, it can happen to you too. ST. JOSEPH, MO. -- Buchanan County's law enforcement center is used to dealing with crashes, but one last week has nothing to do with vehicles and could cost the county tens of thousands of dollars. My God, for blessing me abundantly with, well… everything. You are truly amazing and I can't begin to even articulate my love for you. My family. You put up with me when I'm not at my best and deal with me being gone more than you would like. You make me smile, laugh, and cry with unbridled joy. Other than God, there is nothing more important to me and I love you with all of my being. I never thought I'd be so happy and so proud all at the same time. Thanks for putting up with me and for allowing me to help you. Every day I'm amazed that I get to spend my life with you and I'm truly, truly grateful for that. My Mom & my Dad: You never doubted me for a moment. You stuck with me during times that I needed someone the most. You gave and helped and guided. I am the luckiest son on the planet and I am forever grateful. My patients: I had the calling to be a dentist at the age of 3. It is truly the only thing I ever really wanted to do. Thanks to you, I get to be lucky enough to fulfill that lifelong dream each day I go to my office. Thanks for your trust and your friendship. The office team: Quite simply you all are the best office staff in the world. My career is made so much easier by your support and hard work. Thanks for all you do and for always being there for me! Don: A better friend cannot be had. Thanks for everything. I'm glad we finally got to enjoy some baseball games together this summer. The All Star Game was amazing! Barry & Audrey: We are separated by great distances due to geography, but we are always close in our thoughts and prayers. The Royals: Watching Moose dive after ground balls at third and watching Alex Gordon run down balls in left are still onto of the best ways to enjoy a summer night. Thais and all the gang at Advanstar: Thanks for giving me a home for my writing. I truly enjoy being a part of the DPR family and I want you to know that. Finally, to you: To those of you who read this blog, read my articles, come to the lectures and provide support for all of my writing, teaching, lectures, videos, etc. I am truly blessed that I get to have 2.5 full time jobs and that I love all of it. Your feedback and attendance is appreciated more than I can tell you. As part of our effort to better support the needs of our users around the world, we have established a company based in Zurich, Switzerland called Evernote GmbH. This wholly-owned subsidiary will be managing our business and the Evernote Service for our users who reside outside of the United States and Canada, and will be contracting with those users under Swiss law. The Evernote Service and all of its servers will continue to be operated by the California-based Evernote Corporation. For our users in the European Economic Area, this means that Evernote GmbH is the data controller for data protection purposes. As we announced at the Evernote Trunk Conference in August, we will soon be launching Evernote Business. We have updated our Terms of Service to reflect how existing Evernote Service accounts will co-exist with Evernote Business. Existing Evernote users who are invited to join an Evernote Business account will find that their existing account gains a number of enhancements, most notably the ability to access and share notebooks with others in that business. Evernote Business accounts will be managed by an Administrator who has rights to allow or restrict an individual user’s access to the business’ notebooks, but the Administrator is not provided any information about any user’s personal Evernote account. (We will not even tell an Administrator if an individual user’s account exists.) Nor can the content in an Evernote personal account be accessed, viewed or otherwise affected by an Administrator. We’re thrilled with the number of educators and administrators around the world who have shown interest in using Evernote in their schools, so we have modified our contracts with respect to use by underage individuals who might not be old enough to enter into a contract on their own, including specific guidance for schools in the US where we want to ensure that the requirements of the Children’s Online Privacy Protection Act are satisfied. We have established a policy not to disclose our users’ content to others, even next of kin, after a user’s death or incapacity. We have included this within our Terms of Service and encourage our users to decide whether their content should be available to others, and plan for this eventuality. We have also provided more guidance on the process by which user accounts are closed and how users can delete content from their accounts. We have revamped our dispute resolution process by introducing arbitration provisions that will enable users throughout the world to resolve disputes they may have with Evernote more expeditiously and less expensively. Using arbitration to resolve claims means that users will not be required to travel to California (or Switzerland, for Evernote GmbH users) to file a lawsuit and appear in court and, if the amount of the claim is less than US$10,000, the arbitration may even be done over the phone or internet, depending upon the circumstances. In an effort to resolve all disputes promptly, we are also including a provision that requires both parties to use good faith to initiate the arbitration proceeding within 30 days, with a mutually acceptable arbitrator managing the process. Our changes will provide users outside the US an option to have their dispute resolved through arbitration, but under a special US law, we are requiring users in the US to use binding arbitration as the exclusive means for resolving disputes and to agree that such claims will be resolved only between them and Evernote (prohibiting participation in class actions or similar representative actions). We feel strongly that requiring arbitration of disputes on an individual basis will enhance our ability to work with our users to resolve disputes, while ensuring that an individual user maintains control of the issue raised and resolution desired – and that this will happen much more quickly than the long months or years that class action matters typically require. Because we are requiring arbitration for US users (and others subject to the US Federal Arbitration Act), we will pay the arbitration-related fees for all claims up to US$10,000 and even in cases involving more than that amount if those fees would be prohibitive compared to litigation costs, unless, in either case, the claim asserted is determined by the arbitrator to be frivolous. We appreciate that this is a significant change, so we will permit existing Evernote users who do not agree with this change to “opt-out” of the arbitration agreement by notifying us via the methods described in our Terms within 30 days of December 4, 2012 (the effective date of our new Terms). For years, I've used modules to control my lights in my home. These modules, made by a number of manufacturers, use impulses sent over your electrical wiring in your home to trigger "on" or "off" signals in a controller box. The boxes plug into your outlets and then your lights and appliances plug into the controller boxes. It's pretty basic and easy, but it allows either a PC or a simple remote control to give you the ability to control anything plugged into one of the controller boxes. Well, now comes Spark. This is a very cool idea that uses the Internet to give you the same functionality and more from your phone, tablet, or computer. Head on over to Kickstarter and read all about it! In healthcare, we're always looking for ways to fight cross contamination. Due to these concerns, things that we touch in the day to day treatment of patients need to be cleaned on a regular basis. There are some very nice keyboards on the market that can stand up to the rigors of healthcare and those keyboards are available for about $100. The extra cost is because they are designed and built to be disinfected with some rather harsh materials. I'm not sure that the Logitach Washable Keyboard K310 would stand up to those types of rigors. The website states : * Hand wash only. Use mild soap and a soft cloth in warm water less than 30cm (11 inches) deep and less than 50°C (120°F). Do not wash in dishwasher. Do not use abrasives, alcohol, solvents or harsh detergents. Do not submerge the USB cable. Follow washing instructions in the Quick Start Guide. So… this might be something that is better used in non-clinical areas or covered with a barrier and then washed on a regular basis. The part that I find really intriguing is the price of $39.99 which is amazing for a device that can be immersed in water. Take a look at the Logitech website for all the details. Here's a cool little item that is as affordable as it is unique. 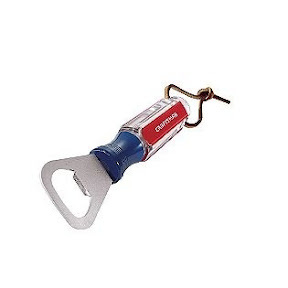 For the DIY person on your Christmas list, how about a bottle opener with the famous look and feel of a Craftsman screwdriver? Actually, it's not the "look and feel" because it *is* a Craftsman screwdriver handle. This little goodie can be had for under $10. That means that for that price you can order 2 and keep one for yourself! If you'd like to order one, here's the link. Aribex, the leader in portable X-ray technology, joins KaVo Group’s impressive portfolio of dental brands. Orem, Utah – November 15, 2002 – Aribex, a worldwide leader in portable and handheld X-ray products, was recently acquired by the KaVo Group, an affiliation of leading global dental equipment brands, effective immediately. The transaction was completed earlier this week, and integration efforts have commenced. Aribex, best known for the NOMAD™ handheld and portable X-ray systems, have global market- leading technology that serves clinical, remote and mobile facilities throughout the world. Aribex uniquely serves the dental, veterinary, security and industrial inspection segments. Aribex is based in Orem, Utah and will continue to be the center of excellence for the portable X-ray business. Handheld and portable X-ray systems are the fastest growing segment in intraoral X-ray systems and Aribex’s innovative products are supported by strong patents, intellectual property and a robust new product pipeline. “We are thrilled to be joining forces with the KaVo Group, a world class dental organization that shares common values and a passion for future success. The KaVo Group combines over 500 years of dental experience with leading global brands and will certainly bolster Aribex’s ability to further accelerate the adoption of handheld X-ray technology,” says Ken Kaufman, President of Aribex. The KaVo Group consists of market-leading brands such as KaVo, Gendex, DEXIS, i-CAT, Instrumentarium, SOREDEX, Pelton & Crane and Marus. With the acquisition of Aribex, the KaVo Group will reinforce its global imaging footprint and commitment to market-leading innovation. Integration efforts between Aribex and the KaVo Group are underway. The group does not anticipate any significant changes that would affect relationships with dealers, suppliers or users. The transaction is subject to regulatory approval and customary closing conditions, including the absence of a material adverse change with respect to the acquired business. Statements in this document that are not strictly historical, including statements regarding the proposed acquisition, the expected timetable for completing the transaction, future financial and operating results, benefits and synergies of the transaction, future opportunities for the combined company and any other statements about managements’ future expectations, beliefs, goals, plans or prospects that may constitute forward-looking statements. These are a number of important factors that could cause actual events to differ materially from those suggested or indicated by such forward-looking statements. X-ray systems are now in use in clinical, remote and mobile facilities throughout the world, from the finest professional offices to humanitarian missions reaching underserved populations who desperately seek care. The NOMAD significantly decreases costs and provides hundreds of safe, high-quality images for dental and veterinary applications on a single battery charge. For more information, visit www.aribex.com. The KaVo Group is an alliance of world class dental equipment brands united by common values of innovation, quality, exceptional customer service and market-leading brands of relevance. The KaVo Group strategically unites leading dental equipment brands including KaVo, Pelton & Crane, Marus, Gendex, DEXIS, Instrumentarium, SOREDEX, Aribex and i-CAT together under one group identity. Collectively, KaVo Group brands represent over 500 years of innovation, quality and commitment to the dental community. Geeks like me just *love* military tech. With the budgets it takes to do the research & development, military departments all over the planet get their hands on the best gear way before the rest of us. Now, the good news is that in a few years that all gets trickled down to us and we get the advantage of the R&D without the millions of dollars coming out of our own pockets. I mean we can thank the military for GPS, Kevlar, and a host of other things we get the benefit of every day. However, sometimes you have to wonder if the money is well spent… And despite my love of our military and its continuing fountain of technology, there are times when even I start to wonder if the money we are spending could be better spent on some other weapon system or even in some other area of government. To that end, I present the F-22 Raptor. It is currently the Air Force's most accident-prone fighter. I was reading the Wired website (one of my favorite websites and by far my favorite tech magazine) and I came across a great story on the F-22 and all of its troubles. It is a very expensive plane and may well not be worth it. Head over to wired and give the article, written by David Axe, a read. I think you'll be glad you did. Ah technology... Those that live by the sword, die by the sword. Toward that end, my apologies to those of you who were part of my Webinar last night. It seems that a tech gremlin crawled into the system and was affecting the audio quality of the program. Because of that, we decided to scrub last night's Webinar and re-schedule for a later date to give us time to track down and eliminate the bug. To that end, I'm glad to say that we spent some time last night troubleshooting and got to the bottom of what we feel was causing the problem. Those of you who had signed up for the program will be receiving an email shortly with the new date and time. However, I can tell you in advance that it will be Wednesday November 28th. It's funny that with all the advances in technology, Webinars are still an unruly animal to try and tame. I've probably done 15 or 20 at this point and it seems there is frequently some type of little bug that pops up at some point during the program. However, this is the first instance I've endured where we've actually had to scrub & reschedule. So thanks for your understanding and I'll talk to you all again on the 28th. As the title of George Harrison's solo debut said "All Things Must Pass". So it seems, must the reign of Apple as the top mobile phone manufacturer in the world. For the first time in… forever… Samsung knocked Apple out of the top slot for the third quarter of 2012. In that period of time Samsung sold 18,200,000 million Galaxy S3 handsets. That's right eighteen million two hundred thousand. In the same time span, Apple sold 16.2 million iPhones. Now don't get me wrong, 16.2 million is nothing to sneeze at. It's just that Samsung sold more… a bunch more. Of course this crazy race is pretty much always neck & neck. The release of the iPhone 5 means that in Q4 of 2012, Apple will probably regain its lead. However, there hasn't been a change of the lead spot in a very long time so this begs the question "is the iPhone market weakening?" Could it be that the closed Apple system which originally caused Apple to be second place to Microsoft for all those personal computer years is once again rearing its ugly head? For years now, that closed ecosystem has kept Apple in the lead with great hardware & great apps. However, it seems that Google's Android with its plethora of handset manufacturers is making serious inroads. All I can tell you is it's going to be one heck of a ride in 2013! Our goal with the redesign was simple: make all major functions accessible within two taps. Achieving this goal was easier said than done. Evernote is a powerful app that’s used for a huge variety of tasks. Our team of graphic and interface designers spent months developing an approach that fit the needs of our users. From quick note takers to hyper organizers, the new Evernote 5 has you covered. We started from scratch when thinking about the home screen. The objective was to let a person create a new note or browse to an existing one with equal speed. To make this possible, we divided the screen into two sections: Quick Notes and Views. Along the top of the app, you’ll find the Quick Note buttons. These let you create a new text note, start a snapshot or digitize physical documents with Page Camera. We made the buttons large so that they’re easy to tap, and we eliminated several steps from the process, perfect when time is of the essence. Below the Quick Note buttons you’ll find a list of Views. Each is designed to help you get to your notes in the way that works best for you. We never dictate how users should organize their information, which means that some people rely entirely tags, others on notebooks, and others don’t use either. With this new design, we’ve found an elegant way to cater to everyone’s needs. Tap or swipe the green bar of a View to expand it to full screen, do the same to return to the home screen. The default All Notes look is our newly designed cards layout. The cards beautifully highlight the content of the note, giving you a good amount of information before you tap. On iPhone, if you prefer a different layout, swipe down from the top of the list to expose the sorting and search options. You can choose the classic snippets layout, as well as a different sort order. Beside the layout options, you’ll find the search bar. It’s always there at the top of the note list when you need it. As always, you can search your account by keywords and by text contained within photos and images. The redesigned notebook list is a huge improvement over previous versions of Evernote. First, it brings all of your notebooks and those shared with you by others into a single list. You can scroll the list to find notes relating to a school or work project managed by someone else just as quickly and easily as you would find your own content. If you want to only see your own notebooks, pull down from the top to show sorting options. In addition to the unified list, this view also shows Notebook Stacks, displayed as a wrapped grouping of books. Notebook Stacks are now also available on iPad! Tap on a notebook stack to expand it, then tap on the individual notebook you’re looking for. We also made it easier to add a new notebook. Just tap on the Edit button in the green bar, then tap onNew Notebook. If you organize your notes with tags, then you’ll love the new Tag View. Your tags are displayed in a list sorted alphabetically or by note count. You can change the sort order by pulling down on the list to expose the sorting options. You can also search for tags by typing into the tag search bar. Location is one of the most powerful ways to remember your experiences. Evernote 5 makes it easy to relive all those memories. If you have location enabled, then every note you create on your iPhone or iPad in Evernote, Evernote Food, and Evernote Hello include location info. Now, you can easily view all those notes on a map. Pinch and zoom to find the area that you’re interested in, then tap on the notes icon in the top right corner of the screen. When you tap the icon, the notes from the selected area will overlay on the screen, allowing you to see the memories associated with that place. To return to the map, simply tap on the pin icon. Evernote is completely free, but for our more active users, we offer some great additional features as part of Evernote Premium. Now, Premium users can easily manage their Premium features from this View. These Premium features includes the ability to download notebooks for fast access any time, PIN lock and more. If you’re a Free user and would like to learn more about the Premium features, just tap on the View. The iPad’s larger screen allowed us to add a great element to the home screen: Recent Notes. This horizontally scrolling list shows you the last several notes that your viewed, edited and created on the iPad. Tapping on one jumps you to the note. Recent notes are great for taking notes in a meeting, then looking something else up, then quickly returning to the note you were editing. West Long Branch, NJ (November 12, 2012) – Following the recent destruction that Hurricane Sandy has inflicted on the Jersey Shore, Darby Dental Supply, LLC, the largest all-telesales national distributor of dental merchandise and equipment, has pledged to donate $5,000 to Lanmark360’s Shave the Shore™ campaign once Lanmark360 raises $15,000. If the goal is met, with Darby’s contribution, the Shave the Shore campaign will contribute a total of $20,000 to those affected by Hurricane Sandy. Originally, Lanmark360 President, Howard Klein, publicly pledged on Facebook NOT to shave until he personally raised $10,000 to help Jersey Shore families struck by Sandy’s path. From this, the Shave the Shore campaign was formed. Klein immediately accepted, and the donations continue to steadily come in. 100% of all donations will go to the American Red Cross Hurricane Sandy Relief Efforts. For over 64 years, Darby Dental Supply, LLC has continued to thrive and evolve as the largest all-telesales national distributor of dental merchandise to office-based practitioners in the United States. Through strategic distribution points, the company fulfills over one million shipments per year from leading manufacturers of dental products. Darby is equally committed to providing in-depth training to its account managers and superior value to the dental professional. Darby’s efficient business model, competitive pricing and convenient ordering system continuously save its customers time and money. Honoring a “one customer at a time” philosophy for more than six decades has established Darby Dental Supply as one of the largest, most trusted dental distributors in the nation. For more information, visit www.DarbyDentalSupply.com. For more information, visit www.Lanmark30.com. Follow Lanmark360 on Facebook (facebook.com/Lanmark360), LinkedIn (http://linkd.in/KH63AI), Twitter (twitter.com/Lanmark360) and YouTube (lanmark360.com/youtube). My travels take me all over and because of that I tend to spend a lot of downtime in airports around the country. Recently I was in DFW waiting on a flight to return home to KC and what I lovingly refer to as "The Land of Oz"; since I live in Kansas. For some reason, I hand a strong desire for some McDonald's fries (I know, I know…) so I soon found myself in the line at the McDonald's in DFW Terminal D waiting for that tasty treat that is oh so bad for me. As I stood in line, I noticed an airman next to me in full camp uniform waiting to place his order. I asked him where he was headed and he told me with a smile, "Afghanistan, but that's all I really am allowed to say." We chatted a bit about life and about being away from home. When we both got up to order, I told the young lady behind the counter to put the airman's meal on my bill. He looked at me, genuinely surprised and told me, "You don't have to do that." What I told him in reply is truly the way I feel. I said, "I get up every morning of the week and go to my office. I do the best I can to take care of the people who count on me and to take care of my family. However, there is never a moment where someone will try to kill me just because I'm doing my job." I also pointed out that paying for a mea in McDonald's is really not a big deal and the least I can do for someone willing to risk their life for me and others they will probably never meet. I don't tell this story to make myself look generous or anything like that. I tell it because it's a great example of how I feel about all of the men and women who put on a uniform and go to work to protect my country and their fellow citizens. I could type and type, literally putting dozens of paragraphs together about how much their service and sacrifice means to me, but it still wouldn't convey how deeply I feel about our armed forces. No matter whether they are on the front lines or behind a desk making sure that those in the front lines are supplied and taken care of, they all sacrifice deeply for the rest of the citizens of our country. I am very, very proud of them and I am very, very grateful for the job they do. If you are a veteran or are currently serving in our armed forces, let me take this opportunity to thank you not only for me but for the entire Flucke family. Thank you for the very important and dangerous job you do that keeps us safe and allows people like me to go to my office without fear of being shot or injured. I've done quite a bit of reading on the wars in Iraq and Afghanistan lately and I've got to say that if I was a "bad guy" in those areas and heard the Americans coming (whether it's choppers or boots on the ground), I'd be terrified… knowing I was going to have a *very bad day*. Thanks for your service, sacrifice, and dedication. I cannot say "Thank You" enough!!!!!!! Next week, on Wednesday November 14th, I'll be giving my webinar lecture for Catapult University on "Streamlining Adhesive Dentistry with Advanced Technologies & Techniques". This will be my third and final time to give this webinar, so if you've been thinking about listening in before and just haven't had the time, this is the one for you! It's also a great way to experience some CE because you can do it from the comfort of wherever your computer happens to be. That means no travel, no time out of the office, or time away from your family. Catapult University does a really nice job with administering these events and you'll be seeing more and more of them in the future being given by some of the best educators in dentistry (and people that I'm honored to call my friends). So even if you can't make my webinar or you're just looking for a different topic, make sure to check out the Catapult University website for details on all of the programs, both past and present. Here are the details on my program. You can register by going to the Catapult University site. Are you looking for options that can accelerate the operative procedures in your practice to a level you've only dreamed of achieving? Welcome to the new world! Through the use of advanced technologies, Dr. Flucke will teach you how to prep, place, and cure adhesive restorations quickly and predictably without sacrificing quality. By utilizing the most state of the art devices and techniques currently available, you'll learn how to create amazing, sensitivity free restoration faster than you ever thought possible. I came across this press release while rummaging around on the Apple website. It's got some interesting into as well as speaking to the new iPad 4 (or Fourth Generation iPad as it is referred to below). With all of the news on hurricane Sandy and the election as well as the iPad Mini, somehow there just wasn't a lot of press given to the 4th Gen device. So… as a public service, I'm presenting the press release here so that you can have the full scoop. Enjoy! iPad mini with Wi-Fi comes in either white & silver or black & slate, and is available in the US for a suggested retail price of $329 (US) for the 16GB model, $429 (US) for the 32GB model and $529 (US) for the 64GB model. Fourth generation iPad with Wi-Fi models are available in black or white for a suggested retail price of $499 (US) for the 16GB model, $599 (US) for the 32GB model and $699 (US) for the 64GB model. Both iPad mini and fourth generation iPad are available from the Apple Online Store (www.apple.com), Apple’s retail stores and select Apple Authorized Resellers. iPad mini with Wi-Fi + Cellular and fourth generation iPad with Wi-Fi + Cellular will be available in the US on AT&T, Sprint and Verizon in a few weeks. iPad mini with Wi-Fi + Cellular will be offered for a suggested retail price of $459 (US) for the 16GB model, $559 (US) for the 32GB model and $659 (US) for the 64GB model. Fourth generation iPad with Wi-Fi + Cellular for AT&T, Sprint and Verizon will be offered for a suggested retail price of $629 (US) for the 16GB model, $729 (US) for the 32GB model and $829 (US) for the 64GB model. Additionally, iPad 2 is available at $399 (US) for the 16GB Wi-Fi model and just $529 (US) for the 16GB Wi-Fi + 3G model where they are sold now. *LTE is available through select carriers. Network speeds are dependent on carrier networks. Check with your carrier for details.